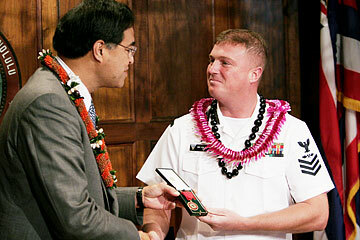 Mayor Mufi Hannemann, left, awarded the civilian Medal of Valor yesterday to Navy Petty Officer 1st Class Larry Cummins in a ceremony at Honolulu Hale. Cummins saved the life of a girl who was in a car that sank to the bottom of the Ala Wai Harbor on Jan. 14. The town-bound lanes of Likelike Highway's Wilson Tunnel will be closed again today from 9 a.m. to 3 p.m. so contractors finish removing debris and installing a chain link fence to prevent more rocks from falling on the road. Scott Ishikawa, spokesman for the Department of Transportation, said contractor Ideal Construction has removed 30 large truckloads of mud, debris and vegetation from outside the Wilson Tunnel on the Kaneohe side, as well as a concrete flap on the Kalihi side that looked like it was going to fall off. The contractor is to install chain link fencing below where the debris was removed to catch any more that might fall, Ishikawa said. Softball-size rocks fell on the side of the town-bound lanes early last week due to the rainy weather. More than 2,000 job seekers are expected at the annual Pearl Harbor Naval Shipyard Job Fair at the Honolulu Community College Marine Education Training Center on Saturday. One hundred positions are available for people who will be paid $17 an hour while also earning an associate degree in applied trades from Honolulu Community College. People interested must apply online at https://acep.hawaii.navy.mil beginning Saturday until midnight on April 9. Information about computer sites for applying will also be available at the job fair. The job fair will be held from 9 a.m. to 1 p.m. at the Honolulu Community College Marine Education Training Center, 10 Sand Island Access Road. Applicants will be notified of their acceptance via e-mail in mid-April and must also pass a test to gauge their writing, reading comprehension and math skills. The University of Hawaii Board of Regents approved a permanent degree program in digital media production at Leeward Community College, at a meeting earlier this month, according to a university news release. The program teaches skills to manage Web sites, produce desktop publishing and design computer graphics. Students also have the option of continuing their studies through the Academy for Creative Media at UH-Manoa. The regents also granted provisional status for the Bachelor of Arts in Environmental Studies and the Bachelor of Science in Environmental Science at UH Hilo. Two men who were charged Monday for two robberies of two Kalihi convenience stores might be suspects in three other robberies. Maliepo Sitani, 21 was charged with second-degree robbery. His bail was set at $50,000. Randal Strong Jr., 20, was charged with fourth-degree theft. His bail was set at $1,000. Police said the two men walked into a 7-Eleven at 2 a.m. Sunday and one of them allegedly took three cases of beer and left the store, police said. The other allegedly showed the clerk a knife and demanded money. The suspect allegedly took the cash from the registers, stole cartons of cigarettes and more cases of beer, then fled. Police also charged the two suspects for allegedly robbing another 7-Eleven on Thursday. Police are conducting photo lineups to determine whether the two suspects might be involved in other 7-Eleven cases. Police said they resemble the suspects in two other cases. Police are asking for public assistance to help find Frederico Cabo, 72, who suffers from Alzheimer's Disease. Cabo was last seen at 5:30 p.m. Monday by his caregiver at St. Francis Medical Center. Police said Cabo was left in the lobby area of the hospital while his caregiver took another patient to the second floor. When she returned, Cabo was gone. Cabo is described as Filipino and 140 pounds, with brown eyes. He was last seen wearing a brown-collared shirt, blue pants and brown shoes. Anyone with information is asked to call 955-8300 or *CRIME on a cell phone. A woman is being sought in the robbery Monday of the Ewa Beach branch of the Bank of Hawaii. Police are looking for a woman who robbed the Ewa Beach branch of Bank of Hawaii on Monday. Police said the woman walked into the bank at 91-775 Papipi Road at about 12:20 p.m. and passed a note to a teller demanding money. The woman, described as in her 20s, fled on foot after receiving an undisclosed amount of cash, police said. The woman is described as 5 feet 5 inches tall and weighing 130 pounds, with a dark complexion. 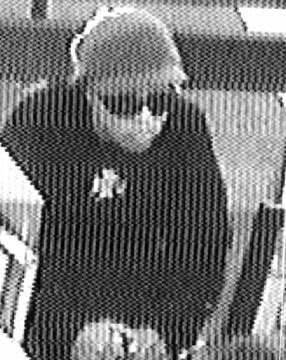 She was wearing a dark-brown long-sleeved shirt, with dark pants, sunglasses and a reggae-style beanie cap.